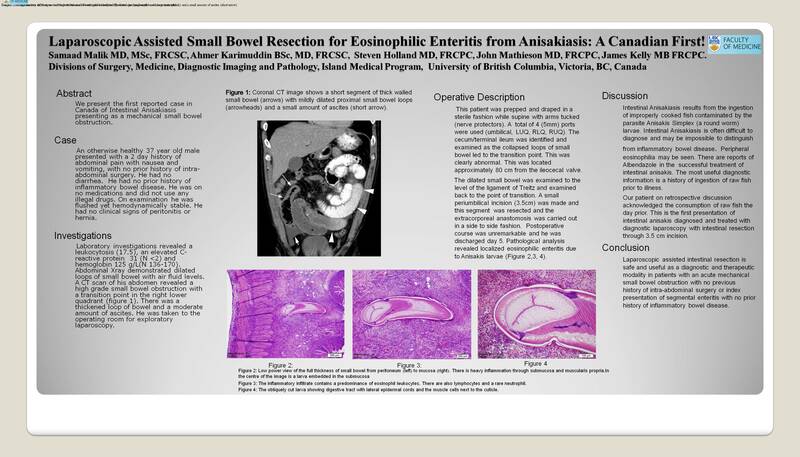 Laparoscopic Assisted Small Bowel Resection for Eosinophilic Enteritis From Anisakiasis: A Canadian First! We present the first reported case in Canada of intestinal Anisakiasis presenting as a mechanical small bowel obstruction. An otherwise healthy 37 year old male presented with a 2 day history of abdominal pain with nausea and vomiting, with no prior history of intra-abdominal surgery. On examination he was stable and demonstrated no clinical signs of peritonitis. Laboratory investigations revealed a leukocytosis (17.5) and an elevated C-reactive protein 31 (normal <2). CT scan of his abdomen revealed a high grade small bowel obstruction with a transition point in the right lower quadrant, with a thickened loop of bowel and a moderate amount of ascites. He was taken to the operating room for exploratory laparoscopy. Intra-operatively, an edematous stenotic segment of distal jejunum was identified and resected. Pathological analysis revealed localized eosinophilic enteritis due to Anisakis larvae. Post-operatively, he made a full recovery. Intestinal Anisakiasis results from the ingestion of improperly cooked fish contaminated by the parasite Anisakis Simplex (a round worm) larvae. Intestinal Anisakiasis is often difficult to diagnose and maybe impossible to distinguish from inflammatory bowel disease. Laparoscopic assisted intestinal resection is safe and useful as a diagnostic and therapeutic modality in patients with an acute mechanical small bowel obstruction with no previous history of intra-abdominal surgery or index presentation of segmental enteritis with no prior history of inflammatory bowel disease.